Jon and I grew up near Chicago and one of the things we miss the most about living there is the food. Not only is the variety out of this world, but the quality is often unmatched. 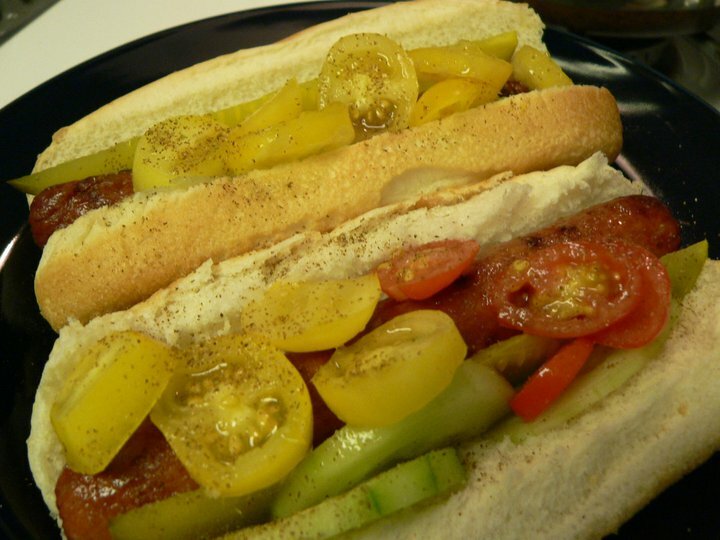 Take the Chicago-style hot dog or the Italian beef for instance. You just can’t find ’em done quite right here in Fort Wayne… well, unless you live in our house. You may think that hot dogs are NOT a fancy food. And as a self-proclaimed food snob, I can understand that sentiment, but you’ve probably never had hot dogs done like this. Mmmmm. And it’s simple- grill your hot dog, buy some cheap buns (or poppyseed if you can find them) and then load it up with your favorite chicago-style toppings. Typical toppings include yellow mustard, chopped white onions, sweet pickle relish, a dill pickle spear, tomato slices or wedges, pickled sport peppers, and a dash of celery salt. My mouth is watering just thinking about it. I changed mine up a bit and went for yellow and red cherry tomatoes from our garden and cucumbers. I left out the relish and white onions. Italian beef is a bit more upscale because it is prepared with “real” meat as compared to the hot dog, but you still can’t find one just right here in town. I’d be happy to be proven wrong. 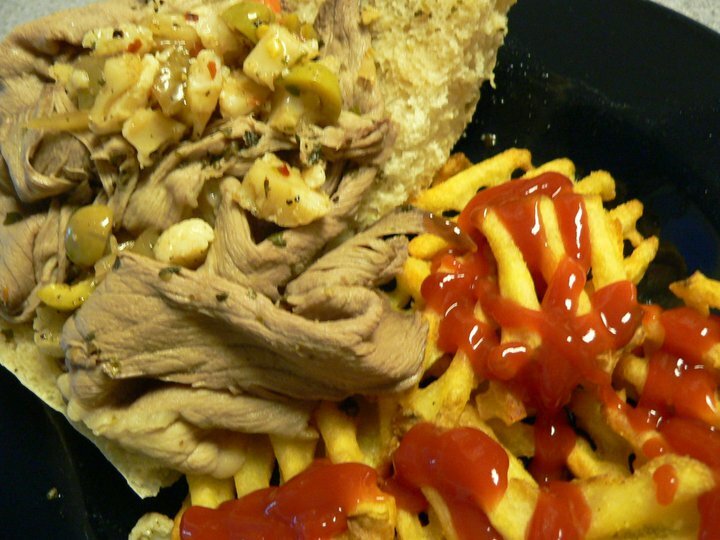 A true Italian beef is not a Beef Au Jus, which you can find at many local establishments. For Italian beef, you douse the meat in a ton of seasoning and cook the roast slowly- sometimes all day, and then slice it up real thin with a meat slicer. When you are ready to serve it, you heat it up in the leftover juices and layer it on top of dense, long fresh italian roll. Jon and I like to drench our sandwich with some of the extra juice and top it off with giardiniera or Italian sweet peppers. It is to die for. If you’ve never had “real” Italian beef, I urge you to stop by Portillos or Buona Beef the next time you are in Chicago. You won’ t be disappointed.